Discussion in 'DVC Resorts' started by Chuck S, May 17, 2013. This is part two of a continuing OKW Lovers Thread. 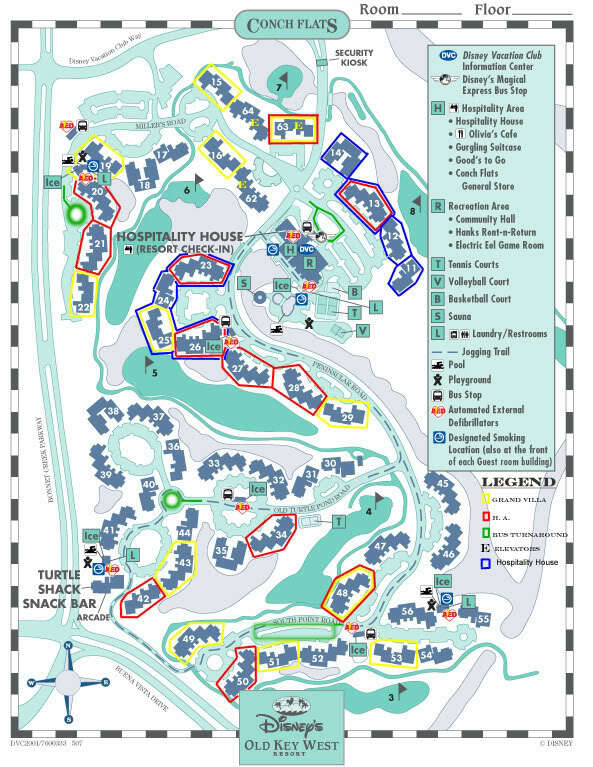 Phase 1 of Old Key West opened in October 1991, at the time the resort was known as the Disney Vacation Club resort. Early purchasers were informed that there may not be any more resorts added to the DVC system, even though more were on the drawing board. Those members that purchased in those early years (prior to mid-1996) of the program received free park admission during their stays at OKW until the year 2000. The original minimum amount of points that could be purchased was 230. About mid-way through construction, there was a minor design change to OKW 1 and 2 bedroom units - a 2nd entrance to the bathroom was added, giving access through the laundry room. This is effective for Buildings 30 and higher. Buildings 11 to 29 have a single entrance to the bathroom, through the master bedroom. There have been a few changes to OKW over the years. Olivia's expanded to enclose the original outdoor dining patio. The current patio occupies an area that was originally home to an herb garden used by the culinary staff for seasoning the meals. The sand castle slide was added to the main pool, prior to that the resort had no pool slide. The rooms went through a full refurbishment, with fresh paint, carpeting, beds, and the addition of woodgrain vinyl flooring in the one and two bedroom units between 2009 and 2010. Buildings 62, 63 and 64 are the only buildings with elevators at OKW, they were built later than the rest of the resort and have elevators because of changes in the Americans with Disabilities Act that took place after the rest of the resort was finished. These buildings occupy the area where the original DVC sales center (Commodore House) and adjacent parking lot once stood, Miller's Road was slightly re-routed to accommodate these new buildings. There are complimentary laundry rooms for those staying in studios located near each of the 4 pools at OKW. Pirate&Princess714, fairytalelover, lchernabog and 2 others like this. Looking forward to our first dvc stay here! August 20-24 thanks to everyone for all their helpful info!!! Looking forward to staying here August 2-9. This will be our first time staying at this resort. We stayed at Animal Kingdom Kidani village in February. Hoping my family enjoys this one just as much. Love OKW! We have stayed in a 2BR twice with 4 adults/4 young kids and had plenty of room. Question on the 3BR- are there any with the master and another bedroom on the same floor.? My kids are young 5/5/3 and I want them in the same floor. No, all OKW Grand Villas are of the two story design, with the master suite, sleeper sofa and sleeper chair on the first level. 2nd and 3rd bedrooms are upstairs. Sitting at the pool right now! I love OKW so much! Even though OKW is our favorite "home", we decided to switch to all AKV/Kidani this trip because our adult DS had never stayed there and wanted to. It just about killed me to cancel my OKW GV for the week of Christmas this morning. I was able to get all nine nights at AKV though, and I'm sure I made someone really happy who was looking for a GV at OKW that week! In that case, I would give the master to the other couple and put you and the kiddos upstairs. One bedroom upstairs has two double beds and its own bathroom, while the other bedroom is quite a bit larger and has two queen beds and its own bathroom. The other option is for the kiddos to sleep on the queen sized pull out sofa and twin sized pull out chair in the living room on the mail level. We will be there for our first time July 20-25. Cannot wait! DH and I are making an anniversary trip to OKW in a couple of weeks. Last time we stayed there was with kids so close to bus/pool was important. Now I am wondering about quiet and water view. Can you please suggest a building you would recommend we request? Thank you so much!!! Buildings 45, 46 and 55 are lovely canal views, and I very much enjoyed the nice view of one of the ponds from building 35 last November. I couldn't agree more, and they are our favorites at OKW along with building 15. We are excited to stay at OKW aug 23-30! With 2 small kids (2 and4) what would you recommend I request as far as room. We are getting a 1bd. With children that young, they may not want to use the slide at the main pool. If they'd be just as happy at one of the neighborhood pools, I'd just request to be near a bus stop. With buildings 30 to 33 you don't need to cross any street to get to a bus stop, so that would likely be a good location. If you think you'll be going to the check-in and restaurant area often, and if you won't have a car, then you might want bldgs 27 to 29, or 15, 16. Buildings 62 to 64 are the only buildings with elevators, and they are often used for those with mobility issues. I am assuming with these suggestions that you are not booked into the "Near Hospitality House" booking category? We have stayed at OKW a few times with our young children (last time was December with 3.5 and 18 month old). We definitely preferred the quiet pools with them, we weren't comfortable with the main pools slide and my 3.5 year old so the smaller quieter pool worked well for us.